It has been quite some time since I posted a book review but this is not so much a book review as much as it is a plea for a translation, this book deserves a much wider audience, than its limited edition of 600 copies and Polish language will afford it. Perhaps McFarland or some other publisher will consider the undertaking the task of translating and publishing Szachy wojenne. I don't read Polish, so what I gleaned of the books contents is from the five page English summary that is at the end of Szachy wojenne. 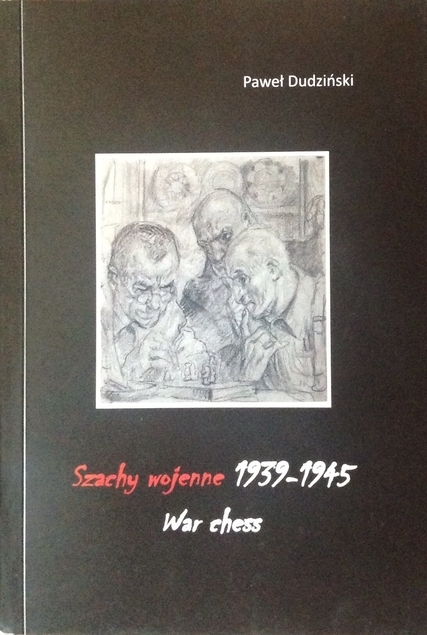 This very handsome book seems to have an illustration or chess diagram on every page, and numerous games many played in harrowing circumstances,but the importance of Szachy wojenne lies in its narration and the English summary gives us who don't read Polish, an idea of the book's value. But also the chess activities of Polish players who were living outside the country fighting withe Free Polish forces, or as the case of the Polish Olympiad team who were stranded in Buenos Aires at the beginning of the war ; or the Poles who were deported to the Gulag, following the partition of Poland by Germany and Soviet Union; which closely followed the German invasion. The Nazis sponsored tournaments in occupied Poland in which Alexander Alekhine and other European masters participated; Paul Keres, and Efim Bogoljubow to name just two. How does affect our view of them? But it is above all the story of the Polish chess players who truly had to "endure the unendurable" , who played chess when they could, clandestinely under yoke of the Third Reich; in the ghettos, in concentration camps; but mainly they had to survive and many perished in the Nazi death machine. So I hope someone will consider translating and publishing this book so that it may reach a wider audience. In the meantime til we have a translation of Szachy wojenne, that I may give it proper review; til then I am working on a couple of reviews which shall post soon. A couple of early Herman Steiner games.